Book directly and save! Come and relax in our comfortable hotel lobby bar. Most of the rooms have beautiful views of the Kinsky Garden, some are oriented into a quiet courtyard. 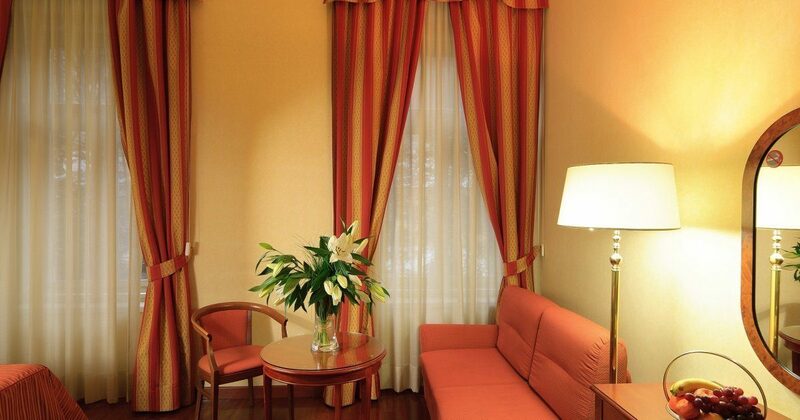 All rooms are soundproofed and decorated with elegant Italian furniture. Wooden parquet floors give a final touch to their stylish look. To make your stay as comfortable as possible, there is a quality mattress and bedding and always clean, fragrant linen in every single bed. All rooms have a private bathroom with shower or bath, hairdryer, mini bar, safe and LCD TV. There is a kettle with tea and coffee making facilities, a desk and a ventilation system where you can individually set up heating or cooling. Spacious, bright room with large windows overlooking all shades of green of the Kinsky Gardens. Two twin beds and a sofa bed will give you maximum comfort.